THERE’S A BAN ON GOLF COURSE DEVELOPMENT IN CHINA AND YET GOLF IS BOOMING. HOW DOES THAT WORK? There’s a [Chinese] saying I have in the book, “the mountain is high but the emperor is far away.” That sums up the disconnect that exists between Beijing and its best intentions, and the government officials in the provinces who may have a different interpretation of these rules or just choose to ignore them all together. The reasons why local governments choose to fudge things boils down to money. They view golf developments as a way to attract business to their areas, to attract a well-heeled clientele. They profit greatly from the tax revenues that these businesses bring in, but more importantly they’re the ones who own the land. That’s why they’re so eager to have these land-hungry developments come into their neighborhoods. 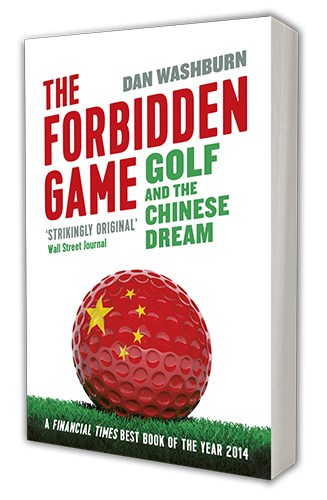 HOW HAS XI JINPING’S ANTICORRUPTION CAMPAIGN AFFECTED GOLF IN CHINA? It seems that golf courses are still getting built. You can say it’s illegal, but you almost need to put quote marks around illegal because more golf courses are getting built in China than anywhere else in the world. We’re at the 10-year anniversary of the so-called moratorium, and there’s anywhere between 600 to 1,000 courses in China. No one knows the real number because it’s all done under the radar. A few years ago the government was trying to get a handle on the number of golf courses and they said they were going to utilize satellite technology to find that out. Related to Xi Jinping, a lot of people in the industry, when they first learned he was going to be the next leader of China, were somewhat optimistic that he may bring a different mindset. There are rumors he was a golfer himself, they thought he might be a little more open or realistic about golf development. But that hasn’t turned out to be the case. Read the rest at WSJ’s China Real Time blog. Filed under Blog, Featured. Tagged china real time, interviews, wall street journal.